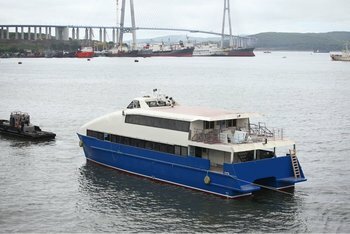 Catamaran passenger ferry CD342. Designer - Incat Crowther Pty ltd (Australia). Catamaran passenger ferry CD342. Designer - Incat Crowther Pty ltd (Australia). Service speed - 25 knots. Class - Russian Maritime Register of Shipping. Flag - Russia. Main engines: number - two, type - MAN D 2862 LE 463, total power output - 2058 kWt.